Now to keep the chickens out. I’ve been making them stay in their coop until 2 hours of daylight left. They destroy everything I do!! 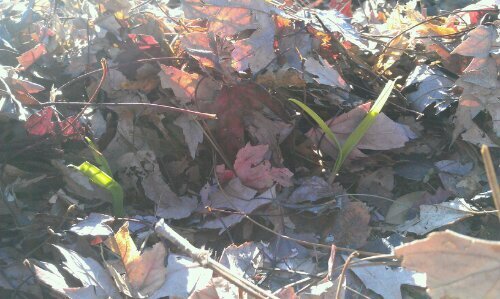 They had a field day with the leaves and straw I put out last week. I just spent nearly an hour raking the beds back together. They can stay. Gotta get a fence around the garden! I put maple leaves in the bottom of their coop so they could scratch around in there. It’s still so cool to open their nesting boxes and find 2 different colored eggs! They are getting a bit bigger in size too. I have the coolest looking dozen eggs on my street, I’m willing to bet! Covered my container carrots and strawberry beds with straw. It’s supposed to be 28 degrees here tonight. They are really flourishing, one thing chickens couldn’t get to! 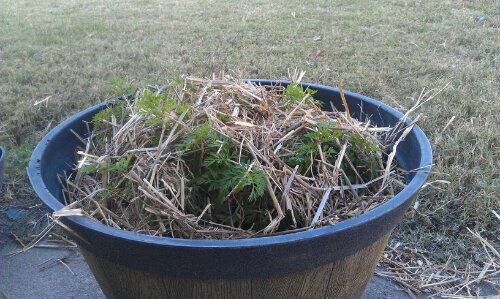 I call them Carrots for Eli to encourage an apartment dwelling friend of mine to garden anyway! I rearranged the chickens new design of the drip hoses. Creative little buggers.